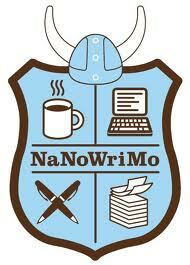 So, the first day of NaNoWriMo went swimmingly. I wrote 1500ish words. Just shy of the daily goal but so be it, I wrote 1500ish words! Cause for small celebration. I'm on the move. Then yesterday came. And went. And no words. No WRITTEN words. Not on the story, at least. Productive day, you say? I say not. There were NO WORDS. What, say you? That I accomplished a lot? That these things needed to be done? That my day was full and busy already? Pshaw. Excuses. Bottom line is, I didn't make it a priority. I chose other things. I did not make room. I failed Day Two of NaNoWriMo and now on my web page it says: 2 unsuccessful days (you know, because I didn't actually make the Day 1 goal either). Aw Madz! You'll get in the swing of it. My plan was to start writing this morning as soon as the kids got on the bus, but instead I had to drag out the vacuum and the power steamer to clean up a soda spill where one of the kids knocked over a glass hubby left on the coffee table before he left for work this morning. Le Sigh! Words! I have words to add. Thanks, Taryn and Patricia for your input! It helps knowing you all are doing this, too. Okay, I do have some words today but the site appears to be sluggish. I guess that is normal? I'll add them later. Maybe I'll have more!